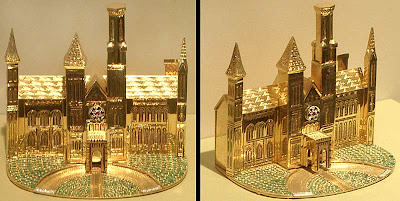 This unique souvenir building replica is this gem-studded model of the Smithsonian Institution’s “Castle” in Washington D.C. Created by jewelry designer Sidney Mobell in 2004, it was crafted with 18K yellow gold and platinum then encrusted with 450 emeralds, a ruby, 5 blue sapphires and 10 diamonds. Mobell is famous for created unusual and extraordinary jeweled artwork - some useful, while others are whimsical. One creation was a monopoly game board made of rubies, diamonds and sapphires, the houses, game pieces and dice molded from solid gold and the play money made of metallic gold paper. The artist gave it to the institution in memory of his wife, Ronnie Grant Mobell, and it’s on display at the Castle’s main room. The Smithsonian's first building, popularly known as the Castle, now houses the Institution’s administrative offices and the Smithsonian Information Center. Completed in 1855, the building was designed by architect James Renwick Jr., whose other works include St. Patrick’s Cathedral in NYC and the Smithsonian’s Renwick Gallery in D.C. This distinctive building is constructed of red in the Norman style - a 12th-century combination of late Romanesque and early Gothic motifs.